Over the weekend, a Tweetstorm erupted when United Airlines barred two teens from entering a flight because their leggings did not meet the airline’s “company benefit travel” dress code. The company has held their ground on their policy, but not before having their brand name affiliated with a runaway story on social media and press outlets for a few days. The bigger issue for United stretches well beyond a dress code. A recently published TotalSocial analysis of the airline industry reveals social influence wrinkles that, if corrected, could help the brand lead more positive conversations among consumers more quickly. According to our TotalSocial™ data, United is not successfully engaging consumer conversations either online in social media, or offline in-person. With a TotalSocial score of 42, it is well below the airline industry average of 50. Only one other carrier (Spirit) ranks below United. United’s social influence weakness extends both online and offline. A primary problem: offline brand sharing, one of the eight performance factors measured by TotalSocial. People are not sharing United content during the in-person, everyday conversations they have about airline travel. United’s online brand sharing score is a full 28 points lower than the airline industry average. 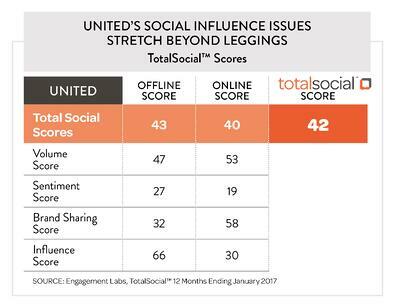 Other weaknesses include its overall offline TotalSocial score (15 points below average), its offline and online sentiment scores (14 and 17 points below average respectively – indicating that both online and IRL conversations occurring about United were not positive in tone even before the leggings story hit), and its offline influence score (14 points below average, indicating the brand’s lack of prominence in conversations about air travel). Despite this overall negative report, there are some glimmers of social influence promise for United. Most notably, its online brand sharing score is also above average – so folks are sharing United’s social media content. United isn’t the only airline brand with social influence struggles. Forbes recently reported on their struggles in a profile. And, we also took a bigger look at the industry. 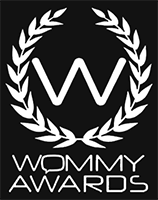 Tell us – do you think airlines have the ability to fly high with social influence? Read more about the airline industry in our recent press release.